Welcome to our product page of Welding Systems , in which you can find detailed information of Welding Systems . Our Welding Systems is good in quality and competitive in price. We are manufacturer and supplier of Welding Systems . We export Welding Systems. We supply OEM service of Soldering and Welding for you. We would manufacture Welding Systems following your specific requirement. We are looking forward to your E-mail and establishing cooperative relationship! 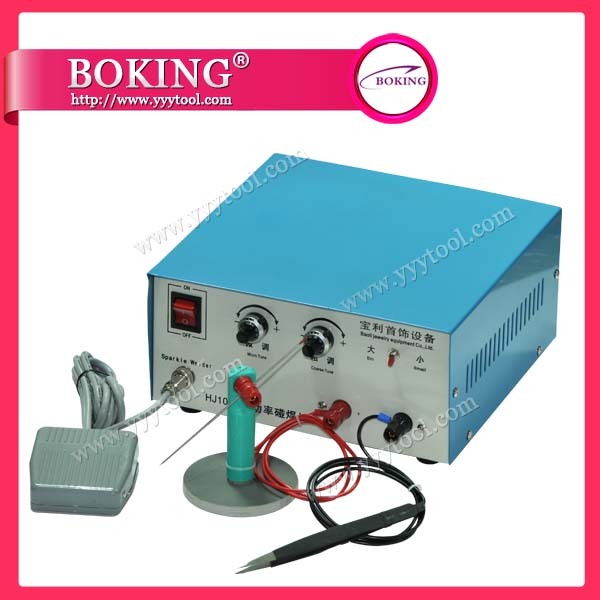 We would provide professional Soldering and Welding with good services for you! Voltage:220V, 50/60HZ, Ampere:80A,Power:120W, Ampere forwelding:0.5~10A,Continuous adiustable (Fluctuation), Weight:7kg, Size:300*170*225mm. Volt: 220V Power: 850W Temperature control range: 30-200C Timing Range: 0-99.9 munites Clamp force: 1600kg (air pressure 8kg/cm) Size: 310x360x450mm Digital intelligent timing and temperature control, which is easy of use. The two plate has independent high precision temperature control system. Control system is in the back of the machine, which is good for heat dissipating and easy maintenance. 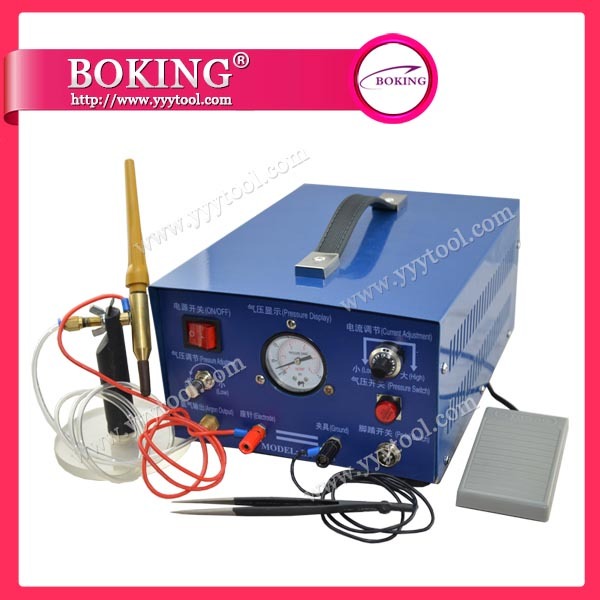 It is a small, easy to handle spot welding device with many advantages. 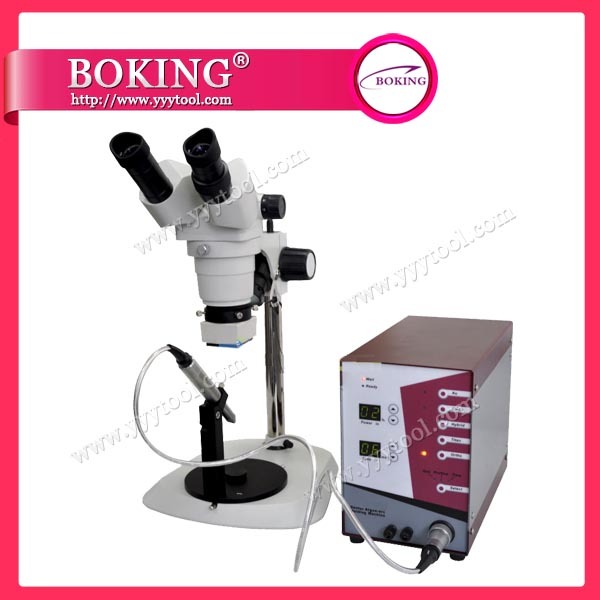 It can be positioned precisely by using the tip of the handpiece. 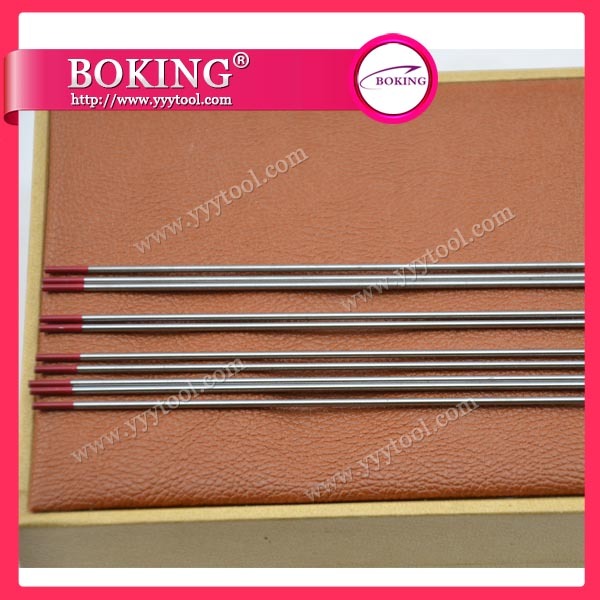 This allows you to fixing the work piece prior to soldering, also possible to create stable and long-lasting connections, especially in places where soldering is not possible. The size of welding points can be set at 20 different levels. The welding points are silky-smooth and uniform in size and texture. PRINCIPLE AND OPERATION When the electrode in the tip of the handpiece touches the work piece, operate the paddle and start the welding process. A small arc is emitted from the point of contact; a small welding point 0.5-2.8mm in diameter (depending on device setting) melts the metals together. By using protective gas during welding, oxidation is largely avoided, so that the work piece can be processed further without any additional treatment. Welding points have maximum homogeneity and a smooth as silk feel. 20 section powers setting are used to set energy and impulse. Select a setting to adjust the welding spot size and the welding penetration depth. The modern LCD welding view protection filter, it guarantees not only an optimum illumination of the work area, but also protects your eyes by means of an additional electronically controlled lens attachment. # Against the tip of handpiece to the points to be welded # Switch on the paddle # Protective gas surrounds the welding point # LCD optic device starts automatically, protects your eyes and environmental # Welding begins # Switch off the paddle # Welding complete The heat created by the arc is very low. This allows you to easily hold down work pieces. Temperatures are similar to heat created during laser welding. 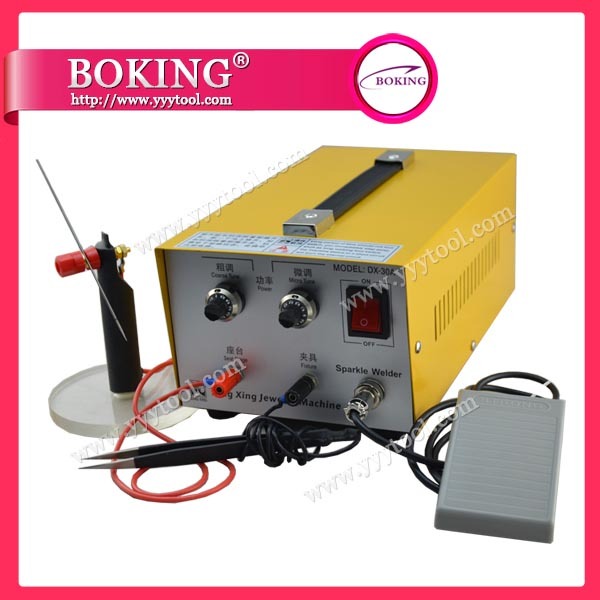 Sparkle Welder Voltage AC220V Current 0.50A Power 105W Welding Current 0.5-10A (Fluctuation) Continuous Adjustable Standard Equipment Paddle, Forceps Clamp, Cable, Optic Device, 3" Pliers, Handpiece, APPLICABILITY All precious metal and precious metal alloys made of gold, silver platinum can be welded. As well as stainless steel, titanium and also aluminum and tin with some limits. In general all metals that are well-suited for arc welding are also suitable for welding. MAINTENANCE Maintenance costs are also low. Maintenance is not required. The only expenses during regular use are low costs for protective gas and replacing worn electrodes. Now, It is popular at professional manufactory. 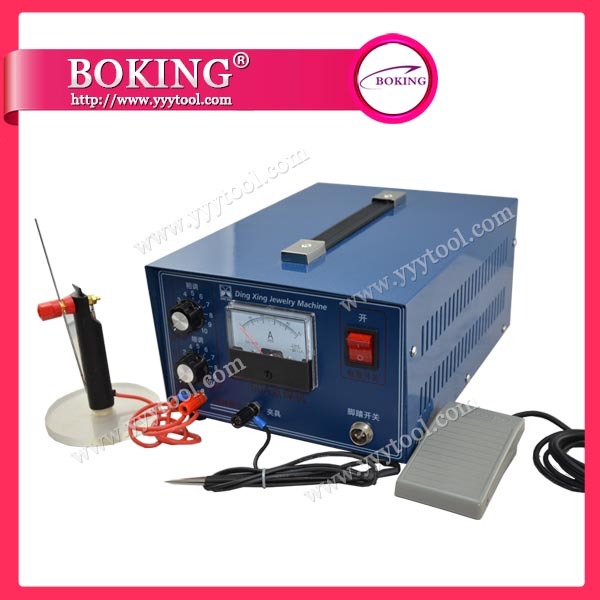 Substitute for gas welding, thermite welding and expensive laser welding. Safety, convenient, economical.